In nature photography when you find a cooperative creature you try to take full advantage. 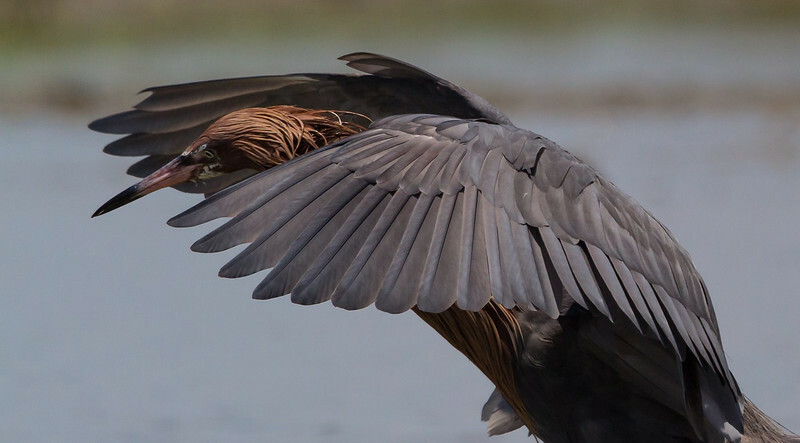 I found a cooperative Reddish Egret on June 7, 2013 at the far west end of Galveston Island and shot handheld actively for about two hours non-stop, continuously moving to minimize distance and maximize light angles. Here are the results, with a few extra birds and a crab thrown in. Aubrey Cruse III was with me and is shown in a couple of shots. Due to very slippery footing I was constantly looking into the inches-deep shallow water and I never saw a single shrimp, but the Egret was snatching them up like an all-you-can eat buffet. Amazing.